When it comes to videogames, it's hard to find a more iconic title than Space Invaders. As a result, the aliens from from the game are incredibly popular and a cottage industry has managed to spring up around the character design. While custom T-shirts and magnets often feature the character, no one's tried to create a themed piece of furniture ... until now. 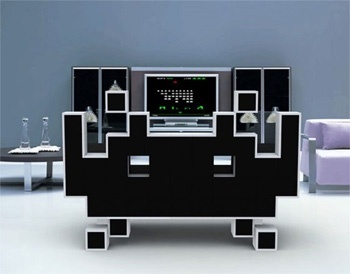 Designer Igor Chak has created the "Space Invader Couch", which is a dead ringer for one of the invading aliens and looks big enough for two people to sit on comfortably. Chak's design is certainly entertaining, and it sounds absurdly comfortable. The couch is meant to be covered in black leather and stuffed with memory foam. Accordingly, Chak intends for the couch to include "two glass surfaces," presumably on top of the arms (based on the slight reflections shown in the concept art). While the concept has been designed, it'll be a while before it actually becomes available to buy. Chak has stated that he's looking for a company to help him produce the furniture piece en masse. When it does hit the market, you can almost be assured that it won't be cheap, based on the memory foam and leather. That said, I'd certainly be proud to own something like this as part of my gaming setup.